"She’s gonna be on my mind my whole career," said Love, who hadn’t played since Dec. 1 at Oklahoma City due to the Timberwolves’ postponed game in Mexico and his grandmother’s passing. "She was somebody who’s been with me from the very start, helped raise me, lived next door to me my whole life. My Grandma Carol’s gonna be with me from here on out." "We had a lot of energy," said coach Rick Adelman, whose team returns home to face Philadelphia on Wednesday. "We had a good tempo to the game. … We kept the same routine all the way through the game. I think we had 31 assists (they did), which means you’re moving the ball." We moved the ball, we had good patience, we were cutting harder," Adelman said. "Everything was just a little bit more in our step tonight than it has been the last week or so." 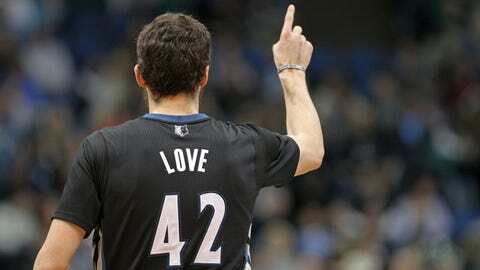 He was terrific tonight," Adelman said of Love. "Just solid all the way through. "He was ready to go."